We turned right to go north up to Oswego on Lake Ontario. 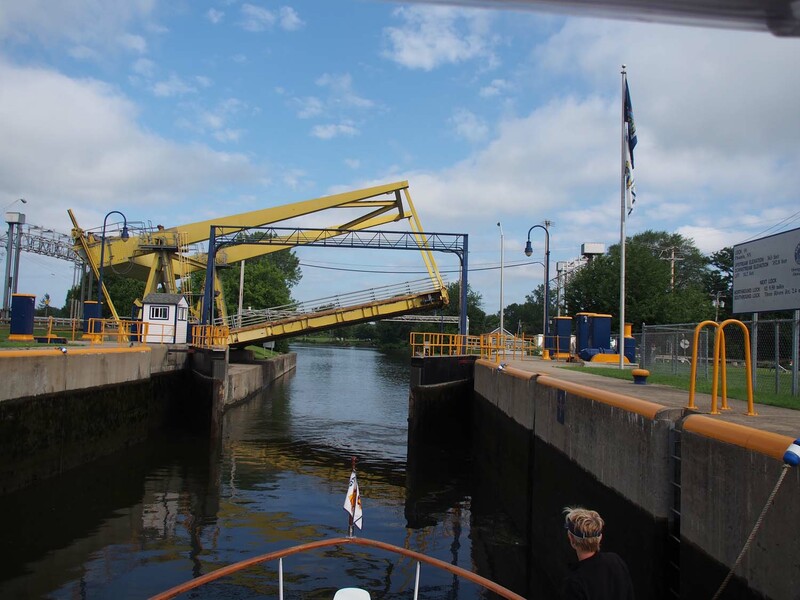 Today’s 25 mile trip on the Oswego canal took us through seven locks, all down to Lake Ontario’s level. Locking down is almost always without turbulence, but lock O3 was an exception. There is a power house and dam just left of the entrance, and with high water in this section of the canal water was running off to the left something fierce. I could see turbulence welling up throughout the area before the dam and powerhouse and it came right up to where we were. I turned to the right and countered it pretty well, but then headed too far right as we entered the lock, corrected and headed too far left, right toward the left wall. 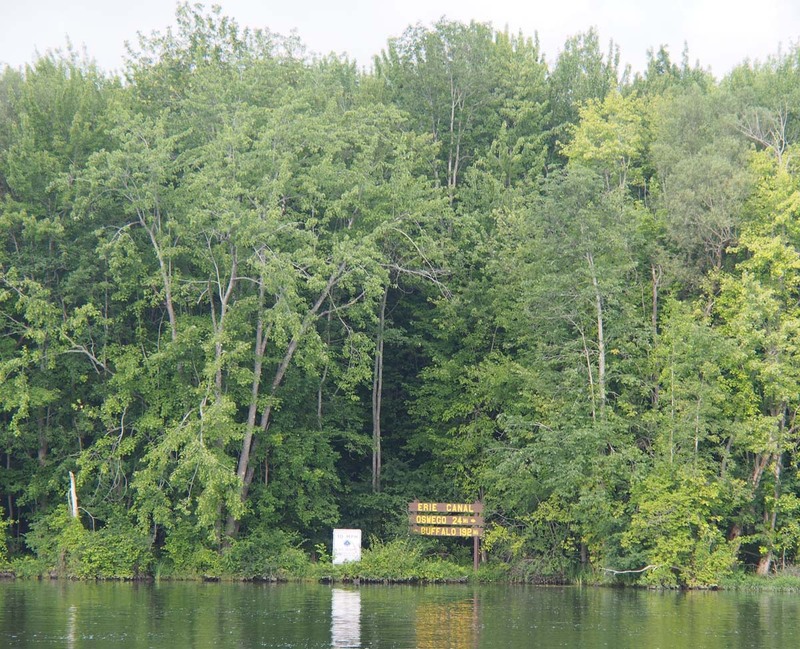 We saw wildlife on the Erie and Oswego canal. 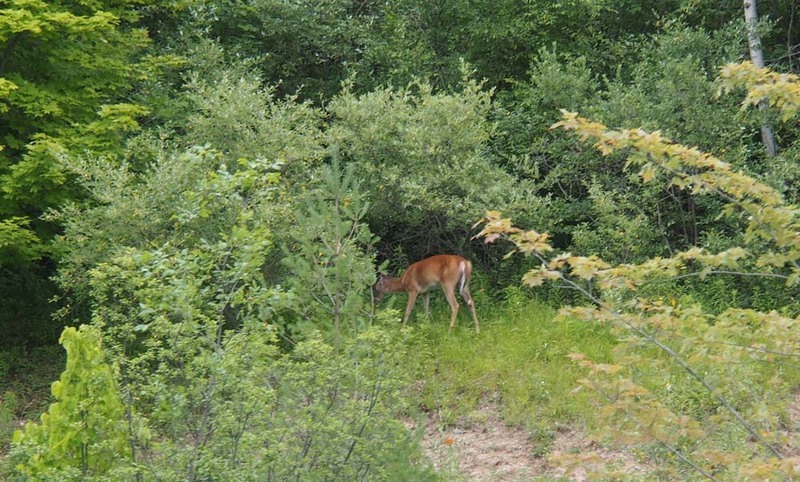 This deer was on the Oswego. 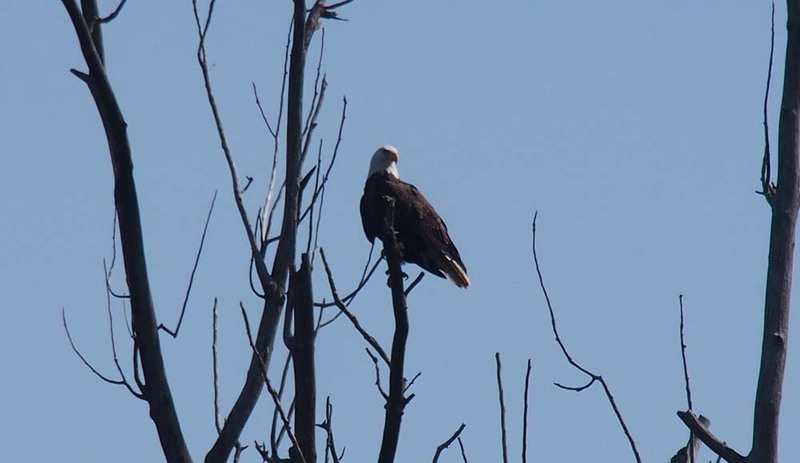 We saw three bald eagles today and caught two of them with pictures. You need some headway to fight currents. Maybe I should have had more, but fortunately I was at idle speed and so could put the right starboard engine into reverse to both slow the boat and turn the nose right. At faster than idle speed the forward motion in the water keeps the prop spinning forward, which is enough to kill the engine when you shift into reverse. A dead starboard engine would be real bad while running into a wall on the left. We almost had a chance to really test those big fenders, but not quite. 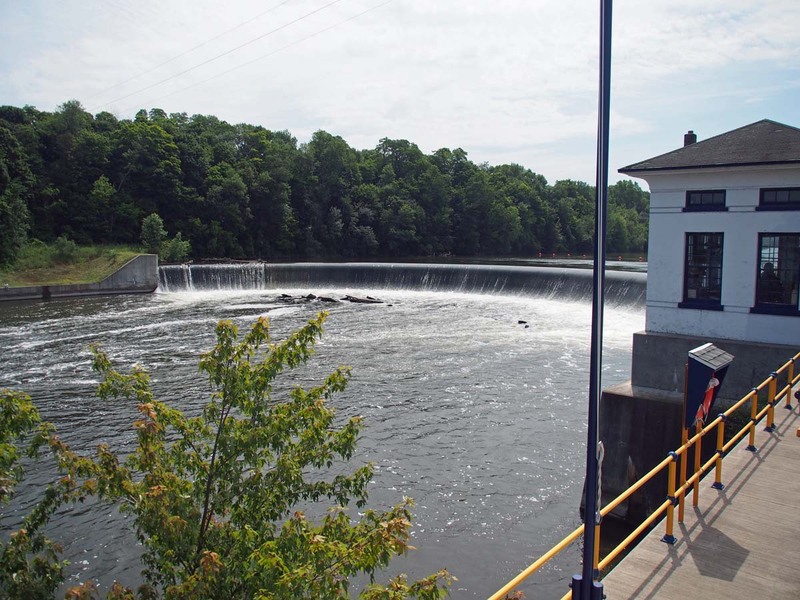 Heavy recent rains closed the Oswego canal for a week. It opened the day before we were on it. 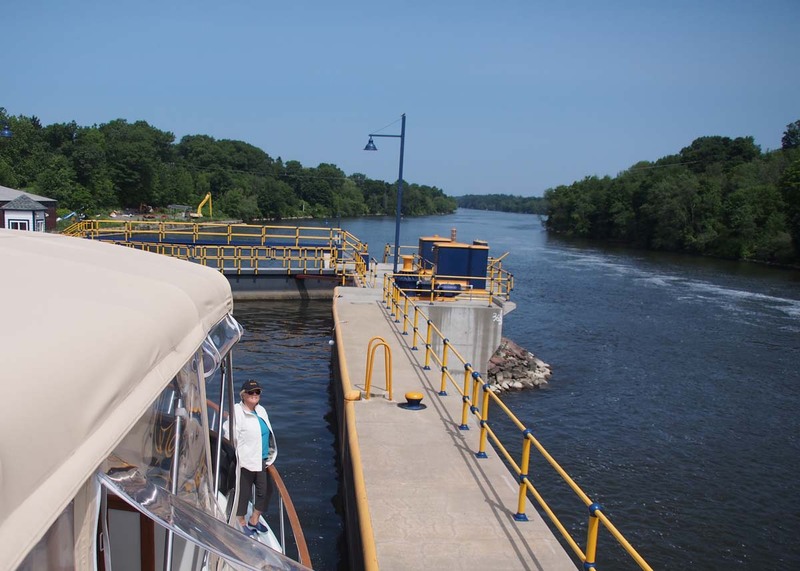 We traveled beside the river for the last three locks. There were seven locks in all with the last three in a row just before we stopped for the day. 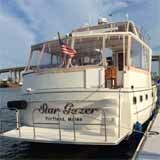 That gave us a total of 29 locks on the Erie and Oswego canals, plus one lock on the Hudson just before Albany. That’s 30 locks from NYC to Oswego. Other than locks, the trip was another great one with outstanding scenery. Due to high water the canal authority had no wake speeds for the entire Oswego canal, so we quietly glided along at reduced speed. The high water caused the river to flow faster, so we picked up 1 ½ miles per hour extra much of the way. Upon arrival we rented a car and planned a road trip to include Syracuse, the glass museum in Corning and Niagara Falls.